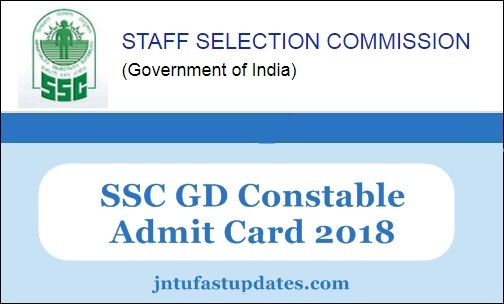 SSC GD Constable Admit Card 2019: Staff Selection Commission (SSC) is going to organize the General Duty Constable written tests in the months of February/March, 2019. Lakhs of hopefuls are going to take part in the SSC GD Constable written test this year. All the hopefuls who are going to compete for the SSC GD Constable written test can get the hall tickets from the SSC portal, ssc.nic.in. Candidates must preferably download the hall tickets to appear for the test. From the hall tickets, candidates can check the details of their examination venue, date, and timings. Also, it is the most important thing to download SSC GD Constable hall ticket 2019 to attend the test. Candidates who do not show the admit cards at the time of verification will not allow to the examination. So, all the competitors are hereby informed to download SSC GD constable hall ticket to proceed with the examination. Candidates competing for SSC GD posts can check more details from the following article. Staff Selection Commission (SSC) is the central government organization that releases various job notifications every year. The Staff Selection Commission has recently released the notification for a massive number of SSC GD (General Duty) Constable posts for various departments such as BSF, ITBP, SSB, NIA and SSF, Rifleman in Assam Rifles and CRPF. Year by year the competition is raising for the GD Constable posts. The SSC has received lakhs of applications from the interested and eligible aspirants from 21st July to 20th August. Candidates having the minimum educational qualification of 10th class along with suitable physical standards have applied for the GD Constable posts during the application dates. The SSC is going to select the eligible candidates through written test, Physical Standards Test (PST), Physical Eligibility Test (PET) and Group Discussion. Candidates scoring good merit in each round will be finally employed for Constable General Duty posts. Candidates applied for SSC GD Constable posts in 2019 August will have the written test in August and September months. Applicants who have enrolled for GD Constable posts will have to attend the GD Constable written test round in the months of September/October. Before proceeding to the examination, candidates must download the admit cards from the SSC official portal, ssc.nic.in. Candidates can check the details of examination dates, timings, and venue details from the admit cards. The SSC GD Constable admit card/hall ticket will be accessible to download before 10 to 15 days of the examination (tentatively). Hence applicants must be patient till the organization announce the examination and admit card release dates. On hall tickets, SSC will provide the information of candidate such as candidate’s name, register no/hall ticket no, father’s name, date of birth, candidate’s signature and photograph, and other particulars. Check all the printed details clearly after downloading the hall tickets. Candidates must carry the admit cards/hall tickets while going to the examination. Reach the examination hall before 30 minutes of the examination time. Carry any of the valid identity proof copy such as aadhar card/ driving license/PAN Card/Passport or any other copy for candidate’s identity verification. Enter the necessary details like Registration number, DOB Etc. SSC Constable Hall Ticket 2019 [General Duty] will be available on the screen. Save it to the desktop and make a hard copy of it and preserve it carefully for further usage.